Alvin McBurney (July 1, 1907 – February 2, 2004), known by his stage name Alvino Rey, was an American swing era musician, often credited as the father of the pedal steel guitar. He was mainly associated with orchestral, big band and swing music, and towards the end of his career, jazz and exotica. Born Alvin McBurney in 1911, Rey grew up in Oakland and moved to Cleveland, Ohio, at age ten. His first interest in music came when he received a banjo as a birthday gift. In 1927 he made his professional debut with Ev Jones and a year later signed with Phil Spitalny. 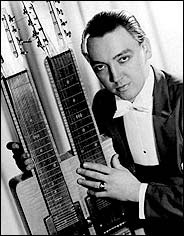 He eventually switched to guitar and adopted the name Alvino Rey in 1929 while performing in New York City, where Latin music was the rage. He worked for Russ Morgan and Freddie Martin before joining Horace Heidt's outfit in 1935. 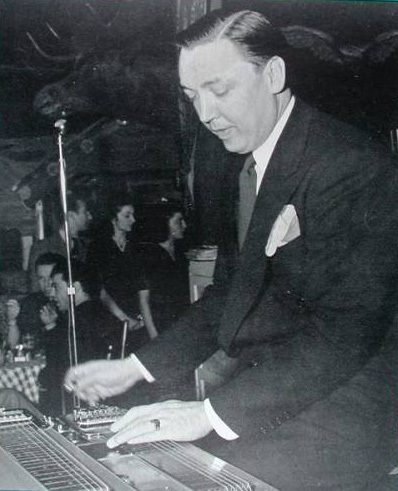 With Heidt, Rey switched to the pedal steel guitar (which he later modified and called a console guitar) and quickly became popular for his unique sound. 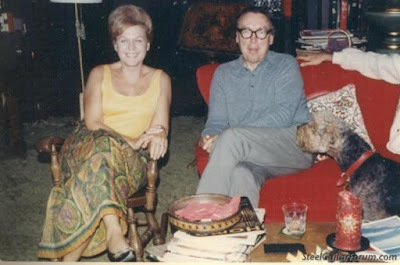 It was also with Heidt where Rey met his wife, King Sister Louise. They were married in 1937. In 1938 Heidt's orchestra landed a spot at the Biltmore Hotel in New York. Their new radio sponsor had signed them on the strength of Alyce King's vocals. Heidt was resentful and seized upon the first opportunity to fire her when one night her microphone fell off its stand and hit a patron. The other sisters immediately quit, followed by Rey, who took saxophonist Frank DeVol with him. They headed to Los Angeles, where Rey worked on forming his own band, which debuted in 1939 with the King Sisters as star vocalists. 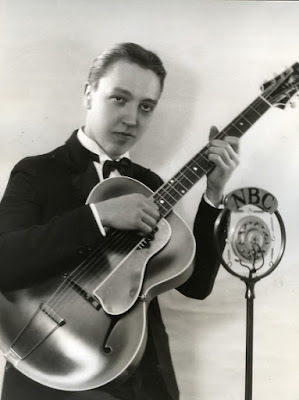 It was an immediate success and they began touring the country, eventually landing a job at the Biltmore, where they had been fired a year earlier and were quickly fired again when Rey played a jazz number instead of the society dance music favored by the house. The group found refuge in New Jersey at the Rustic Cabin, where they were broadcast over radio station WOR. 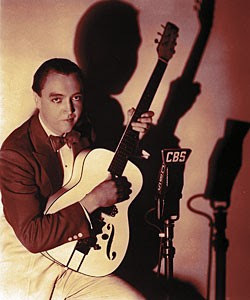 Rey became famous for opening his act with an effect that sounded like a multitude of electrified voices, a gimmick whose technique he refused to reveal but involved Louise singing into a mic connected to his guitar. He was also well-known for playing Latin and Hawaiian music (two styles he later grew to hate). In 1941 Rey's group substituted for an ailing Dinah Shore at New York's Paramount Theater, which led to more exposure, and soon they were one of the most popular acts in the country, garnering top ten hits and making appearances in Hollywood films. In 1942 Rey reorganized his orchestra, bringing in an enormous brass section. The new line-up included such future stars as Ray Conniff, Neal Hefti, Billy May, Johnny Mandel, and Zoot Sims. Though considered one of the best bands of all time by critics, the musicians' union recording ban of 1943 meant they were never able to record. 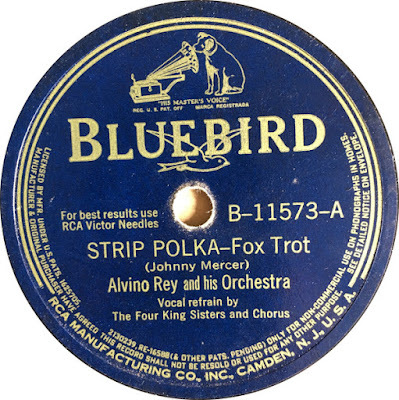 Financial hardship caused by the strike forced Rey and his musicians to take night jobs at a war-plant before Rey officially dissolved the group in 1944 and enlisted in the Navy, where he formed a service band. After his discharge in late 1945 Rey formed a new orchestra, which produced a few hits before being disbanded in 1950. Rey toured with small combos throughout the rest of the decade. 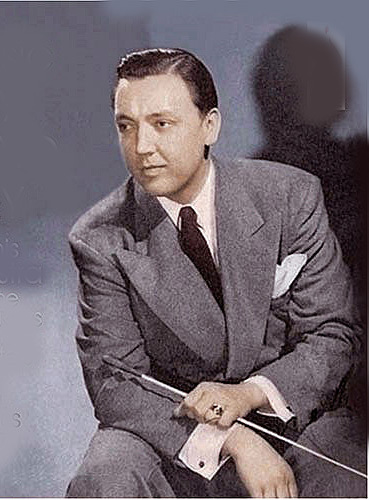 In the late 1950s he served as music director for the King Sisters as they made their comeback. He also worked on several exotica projects with such artists as Esquivel, George Cates, and the Surfmen. Rey was one of two ukulele players on the March, 1961 recording sessions for the Paramount movie "Blue Hawaii," backing Elvis Presley. In 1965 ABC broadcast a special featuring the extended King Family. This special grew into a series which ran for five seasons, with Rey as musical director. Rey continued to perform well into his eighties and made his last public appearance in Salt Lake City, in 1994. 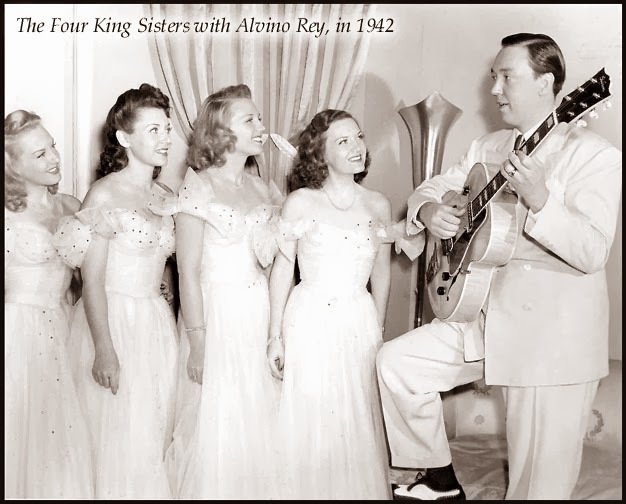 This set of two dozen tracks offers some fine recordings from the great guitarist/bandleader Alvino Rey, supported by the brilliant vocal group the King Sisters. Great variety is here, and humour too, with the band's treatment of Mercer's classic Strip Polka, while the sisters' versions of Cielito Lindo and Tiger Rag are captivating. Thanks Bob. Love the King Sisters. Didn't know one was married to Alvino.